Known for its highly banked turns and concrete surface, Bristol Motor Speedway hosts the NASCAR Sprint Cup teams for the IRWIN Tools Night Race Saturday. With the Chase for the Sprint Cup fast approaching, the Saturday night race at Bristol Motor Speedway's tight short track becomes a serious test for the NASCAR Sprint Cup drivers needing a strong points showing. Besides the potential Chase contenders, all 43 Sprint Cup drivers and team qualifying into the IRWIN Tool Night Race will prepare for 500 laps around a race track that tests physical as well as mental states. The 0.533-mile short-track supplies an exciting combination of speeds and tight quarters which has allowed the Bristol Motor Speedway to become a top attraction on the NASCAR circuit. In qualifying for the 250-lap IRWIN Tools Night Race on Saturday night, the #39 Chevrolet of Ryan Newman scored the top spot ahead of the Roush-Fenway Racing Ford Fusions. 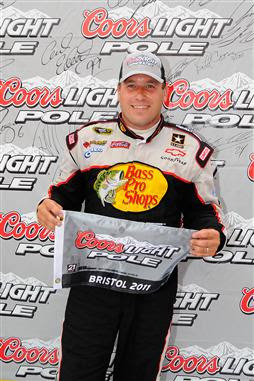 Newman's 48th career pole in the NASCAR Sprint Cup series, the Stewart/Haas Racing driver starts from the pole position for a 2nd time in 2011. Fortunately for Ryan Newman, his last pole at New Hampshire Motor Speedway concluded with victory. Ryan Newman heads into the Saturday night's NASCAR Sprint Cup race with the motivation of a victory gained in a Whelen modified race on the Bristol Motor Speedway track Wednesday. Second fastest in qualifying was the #99 Ford of Carl Edwards followed by Roush-Fenway teammate Matt Kenseth. Contending for the top spot entering the Chase for the Sprint Cup, Edwards enters Bristol after a costly 36th place finish following the past Michigan event. Jeff Gordon and Mark Martin (two Hendrick Motorsports vehicles) have qualified 4th and 5th for the Saturday night event. While Ryan Newman took Stewart/Haas Racing to the highest of highs in the Friday time trial, the driver/owner behind the wheel of the #14 Chevy ended up far away from the pole-winning #39 race car. Tony Stewart will start 42nd after an off-pace qualifying effort. Winning once on the Bristol Motor Speedway in 2001, Stewart's last two Cup efforts on the 0.533 short track resulted in 19th and 27th place finishes. The IRWIN Tools Night Race will start 7:30 PM Saturday for 500 laps around the Bristol Motor Speedway. Weather forecast indicate conditions should be hot but dry.